Not sure where I'm going with this post today, where it will end or even why I'm writing it. I'll just see how it pans out. I had a strange dream last night and felt I had to write about this. In my dream I was on a journey of some sort, which was very enjoyable. My problem, however, was that I always had another half of the distance to travel and so I knew I would never return home. When I'd travelled half way I still had half to go. But when I had done half of this particular half, I still had another half to do and this went on ad infinitum, which meant I could never reach my destination. When I woke up this got me remembering about how, when I was in my teens, I used to muse over various questions which were popular at the time. Such as: If a tree falls in a forest, and no one was around to hear it, does it make a sound? But the one question that always got to me was about completing a set distance. To complete the distance I would first have to cover half the distance. Then I have to cover half of the remaining distance, but when I'd travelled half of this ... then I have to travel half the remaining distance, but when I'd travelled half of this ... and so this will go on forever. At the time I concluded that there must therefore be a basic unit of matter from which everything is made or constructed. I remember reading about atoms and presumed this had to be the answer. But atoms are 99.99% space. So that means I'd have to travel through this for eternity as well - providing I split the atom first, of course. All of this got me back to my dream. But then I got thinking about what would happen if I kept on halving time. Again there would always be a half of the time remaining ad infinitum: Half of a half of a half of a half of a half ... I would never reach the end of time. After writing the above, I tried to look on Google quickly to see what I could find. The journey is similar to Zeno's Paradox. 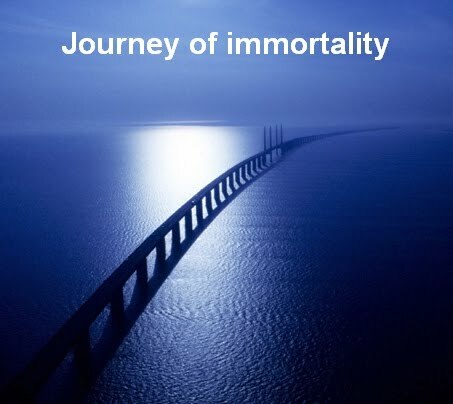 But could this actually be an argument in favour of immortality - as we will never reach the end of our existence. Like Gods we will continue forever through time and space, maybe never quite reaching our final destination unless, that is, we fully merge with our creator. So that's how this post has panned out. Your interp of the dream is most interesting. And undoubtedly true. Immortal through time? Trying to grasp the idea of my consciousness/identity being obliterated is what launched my lifelong search and interest in afterdeath studies and philosophies. Perhaps the dissolution of consciousness is akin to the same idea of halving---it can never happen completely! Thank you for another thought-provoking post, Mike. And sending you and yours positive thoughts for a healthy and fulfilling new year. Trish and Rob: Perhaps even immortal because there is no time. musingegret: I used to think about not being around forever when a small child as well. I found this very scary but somehow I never - and it's probably the same for all of us - thought I would ever completely die. I also used to think about the time before I was born and wonder where I was then. Unfortunately I still don't have the answers with 100% certainty, but hope to one day. I've sussed you out Mike. You just write some of your posts to make us think ;-) You succeed with me. Amazing post. You make me wish I still dreamed. I am going to have to think on this one. I am fascinated. This is a very interesting 4D post. Linear time, even in our third-dimension understanding, has no beginning or end. I don't have the time (!) to research but think it was Einstein who gave a visual of time as being a cube-cubed. The cube is a 3D construct much as we are on this planet. But we also exist within the forth dimension of time which is a level of energy outside our perception, so we have made time a concrete part of our lives with calendars and clocks. Another visual of time I like was presented by Lee Carroll who channels Kryon. This image is of a train on a track that seems to go in a straight line forever in both directions, in front and behind us, while we are at a fixed point on the track. It's actually a massive circular track but the best we can perceive is the straight track in view that seems to go forever into infinity in both directions. Yet if we could see the track from a 4th dimensional view we would see it is a circle around the globe so if we ride the train long enough, we would eventually return to where we began. To throw reincarnation into this mix of delightful theories and visuals, maybe each life journey retains all the time we've spent on this track, halved each time in distance, until we arrive at a potent and condensed space and time - and finally see the whole track - from the 4th dimension of time. Then we get to move into the 5th dimension expansion of space. I just started a blog which loosely fell in the "philosophy' category ( a deconstruction of society and an exploration of human perception) and I thought I'd check out the philosophy topblogsite rates as number 1 (it's you, as you probably know...) WEll, I was not disappointed! Great perspective, I can tell you are a fellow dreamer. I look forward to reading more of your posts!!! I am very new here and what a great fist discovery you are. Terri: Thank you so much for your comment. This has given me much to contemplate. Never thought of including reincarnation into the equation. anon and dbsandman: Thanks for taking the time to comment.